Toshihiro Suzuki, 57, right, assumes his role after his father, long-serving chairman Osamu, last month said he would step down as CEO. Osamu remains chairman. TOKYO -- Suzuki Motor Corp. tapped the son of the company patriarch to become CEO, keeping management of Japan's fourth-largest automaker with the founding family as it tries to recover from a testing scandal. The widely expected announcement followed an annual shareholders meeting earlier in the day, when the company said it anticipated "major" impact from volatility in currency markets after Britain voted to leave the European Union. 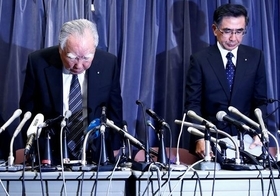 Toshihiro Suzuki, 57, assumes his role after his father, long-serving chairman Osamu, last month said he would step down as CEO to take responsibility for the firm's use of incorrect testing methods to calculate vehicle mileage. Osamu, 86, will remain chairman. Having led the company since 1978, the patriarch will extend his run as one of the longest-serving global auto executives, raising questions about how much longer he can run the company. Analysts said that while succession had been a long time coming, having father and son in the top two positions means Osamu would reign as he has for nearly 40 years. "So long as Osamu-san remains chairman, nothing much is going to change," Marusan Securities analyst Hiroaki Mochida said. But Mochida said in the near term, Osamu was the best hope in fighting off competition in emerging markets including India, where Suzuki commands a market share of around 40 percent. Suzuki decided to exit the U.S. market in 2012 after years of lackluster sales. Wednesday's announcement marks the second executive position passed on by Osamu to his eldest son, who becomes CEO nearly a year after being appointed president as part of the succession plan. Quiet and soft-spoken in comparison to his outspoken father, Toshihiro joined Suzuki in 1994 after a stint at Toyota-affiliated parts supplier Denso. He also previously led Suzuki's product planning and global marketing divisions. Earlier on Wednesday, Osamu brushed off a call from a shareholder to relinquish control to take responsibility for lax procedures which led to the use of wrong testing methods, sullying Suzuki's brand image. "Stepping down [completely] to take responsibility is irresponsible," Osamu told applauding investors. "It's important to stay at the company to prevent a repeat of the worst scandal facing the company [since I've led it]." At the meeting, the company said volatility in the Indian rupee and euro would have a negative impact on earnings, adding it would mitigate the impact through cost-cutting and increased local procurement at overseas plants. Budgeting for exchange rates of around 105 yen to the U.S. dollar and 120 yen to the euro through March, Suzuki is already bracing for a 62.0 billion yen ($605.59 million) hit this year due to currencies, contributing to a 7.8 percent slide in annual operating profit versus the year earlier. Analysts said a rise to 100 yen and 110 yen in the dollar and euro respectively will weigh on operating profit by around 5 percent this year, lower than the average hit of around 17 percent across Japanese automakers expected by JPMorgan analysts. With a diversified production base featuring India and Hungary, Suzuki has lower currency exposure than Japanese peers. The automaker produces roughly 6.5 percent of output in Europe, compared with around 59 percent in Asia excluding China.